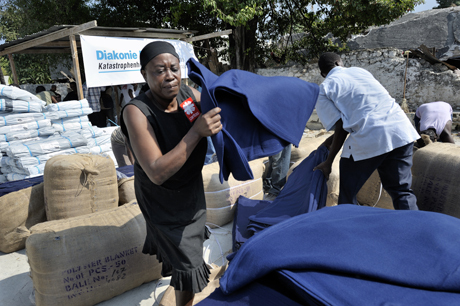 Earthquake survivors in the quake-ravaged Haitian city of Leogane unpack emergency supplies provided by Diakonie, a member of the ACT Alliance, and Caritas Internationalis. Photo by Paul Jeffrey/ACT. WINNIPEG- The Canadian Lutheran World Relief (CLWR) Appeal for Haiti has now raised just over $1 million. Launched on January 13, one day after a devastating 7.0 earthquake rocked Port-au-Prince and the surrounding area, the appeal has received an outpouring of support from across the country. Donations have been received from individuals, congregations, church groups, schools and Faith Life Financial branches. CLWR has been working with other members of Canadian Churches in Action (CCA) to apply for additional matching funds being provided by the Manitoba government and Canadian federal government. To date, an additional $89,000 has been granted to CCA from the Manitoba Council for International Cooperation. A further $1.9 million has been requested from the Canadian International Development Agency (CIDA). A decision on that application is expected on February 26. CLWR and CCA will be supporting the work of the ACT Alliance in Haiti. Several ACT members have been on the ground in Haiti providing immediate emergency relief including the Lutheran World Federation (LWF). The proposal submitted to CIDA seeks government matching dollars to provide materials for temporary and transitional shelter including tool kits, kitchen kits, hygiene kits, tarps, rope, and metal roof sheeting. The project will also provide safe, reliable drinking water and sanitation services and help families improve their health and physical security as they cope with the disaster and begin rebuilding their lives. CCA is in the early stages of formulating a proposal for long-term recovery that will focus on the need for permanent housing. It is hoped that government matching funds will be eventually made available for this type of work. Collectively, the Haiti appeals of CCA member churches and agencies have received $15 million. CLWR carries out emergency relief and development projects on behalf of Lutheran Church–Canada and the Evangelical Lutheran Church in Canada. Follow updates on Haiti at www.clwr.org.